Advertising with Roseland Online could get you noticed by our up to 2,500 unique visitors a day! Not only that, our links to your website will boost your Google rankings, so you get a double whammy when you choose us as your partner! Having your own advertising page in the services section costs just £84 a year pro rata from 1st June. This price includes the page setup and multiple images and copy, with links to your website, email and social media feeds. We also do a special 2nd-Ad-half-price offer if you wanted two separate block ads in two different services pages, so you only pay £126 instead of £168! If this is something you’d like to go ahead with, just email us your pictures/logo and some copy and we’ll make a mock-up for you. Once you’re happy, we go live. 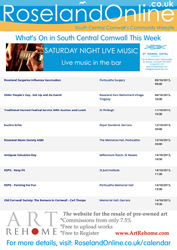 Alternatively we have now two advertising packages on the weekly What’s On poster which go out to over 1200 email addresses each week and are posted on B&B and hotel poster boards throughout the Roseland and South Central Cornwall. 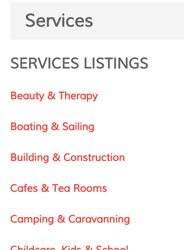 The first is a simple listing for an event you have going on, alongside the other non-profit listings. This is just £5 per line/day per week. Secondly, for a higher profile presence, we offer a banner ad on our What’s On poster. These are normally £25 per week or a package of ten individual weeks at your discretion for just £200 (depending on availability). 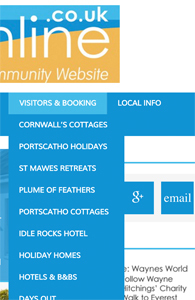 If you’re in the Visitors and Booking Sector, we have a direct link opportunity from the main Visitors and Booking main menu direct to your website. This is great if you want a very high profile on Roseland Online and is just £300 for twelve month’s listing. Additionally, if your event or a business needs a one-off sponsored announcement, we offer a very worthwhile ‘push’ through our announcements listings which go out both on the website and shared on our social media feeds (Facebook, Twitter and Google+). This one off mention costs just £20 per post. Lastly, we have a ‘main sponsor’ opportunity. This will see your logo permanently in our website header as a main sponsor with a link back to your website from our sponsor’s page. Fabulous profile whilst showing your support for the work we do for the community! This also includes your logo on all 52 of our weekly What’s On posters… and all for just £300 per year! For individuals, if you have something to sell for under £500 or as a business want to post a job listing, these are all free of charge (with a £2.50 charge for an additional picture). For items over £500 there is a £10 charge including an image. We also have an excellent offer for property listings. Just £50 allows a full page with images, links and details about your property or let and stays live until it’s sold/let! Roseland Online is a not-for-profit enterprise and all proceeds from our advertising go back into the community and towards the site’s upkeep, so thanks for helping us help you! Just email mark@roselandonline.co.uk to discuss your individual needs and we’ll get you connected to our ever expanding community and its visitors alike!